I’m currently in the process of chronicling my second submission to the Video Game Authority, an organization that grades and encases the games I submit– never to be played. So I have to anticipate yet another round of outcry from outraged gamers who’ll again adamantly proclaim that games are meant to be played, not encased in acrylic plastic. And while, yes, games intended function was to provide entertainment and escapism by immersing yourself into the game by playing it, the popularity of video game grading and video game collecting in general might suggest that hobbyist are collectively participating in a more abstract engagement of video games that extends beyond its intended purpose. And that’s a good thing. So maybe now is a better time than any to ask– can you really appreciate a video game without playing it? Of course. Otherwise there wouldn’t be video game collectors who try to collect every NES game in the library. I mean, why else would anyone in their right mind own a copy of Deadly Towers? Collectors who collect games– good or bad– without playing them might be deviating from the functionalist approach to video games not to rob the hobby of its authenticity, but rather to appreciate the games beyond their function. Non-gameplay elements such as packaging aesthetics and cover art play an important role in the desirability of a game, even if it only sits on a shelf. Similarly, the appeal of owning a game is directly related to the cultural impact a game had or its role in creating societal change. Many collectors (retro games and otherwise) seek out unusual and quirky items, because they enjoy how bizarrely they were released, marketed or designed. Games like Plumbers Don’t Wear Ties, the Legend of Zelda trilogy for the Phillips CD-i and games with typos or mistakes are collected for this reason. Nevertheless, there continues to be a stigma placed on collectors who keep some of their games sealed for the sake of preservation or to simply retain the value of the item. Like I mentioned in my previous post about retro game collectors’ exclusive use of the word “resellers,” it seems that only retro game collectors judge other collectors for what they do with their own property. For example, you’re not likely to hear someone put down coin collectors because coins are meant to be spent, gun collectors because guns are meant to be fired, stamp collector because stamps are meant to be mailed. Because their appreciation of coins, guns and stamps is based on the culture of the hobby, not the utility of the products. So while a purely functionalist gamer and a game collector behave differently, they are both celebrating the culture of gaming in equally valid manners. But the demonization of certain types of collectors may suggest that the validity of game collecting is a bit more complicated than that. Stage one: owning a once-used game that you probably won’t play again. This is likely the most socially-accepted form of buying games that you’ll never play, perhaps because there exists an open and immediate goal– to complete a collection. This seems most common with NES collectors (such as myself) who want to collect every game in that console. Of course there is not enough time (or desperate boredom) to play all of those games. But within the collecting community, this stage is least condemned because the appreciation for the culture is most evident. Stage two: keeping a game sealed, thus providing proof that it has never been played. This is less accepted, because the collector may be considering the potential value of the game at the expense of its utility. And while many see collectibles as potential investments (think of baseball cards in the early 90s), any time the idea of treating retro games as a commodity is asserted, game collectors are sure to call foul. Stage three: getting the game graded so that nobody can play it. This is one of the least accepted forms of collecting. And it frequently stems from game collectors who have never tried submitting or do not understand the process. Of course, there are many pros and many cons to video game grading (I’ll elaborate on this topic soon in another post), but the process is likely to appeal to the collectors who seek to archive pieces of their collection, much like a librarian. The stigma for this is similar to that of stage two, only intensified. DO GAME EMULATORS MAKE THIS ENTIRE ARGUMENT MOOT? Many collectors perceive keeping a game and not playing it as depriving someone else the experience of playing that game, which is a thoroughly inadequate argument– for a lot of reasons. Firstly, any game that you would legitimately want to play can be played on emulators, which have gotten much more advanced over the years. Not only can you play the games with the exact same graphics and gameplay as you would with original copies, but there are adapters developed specifically to allow you to use the original controller. In fact, after a few years of not being able to find Shining Force 2 for the Sega Genesis, I purchased the game on Amazon and used an adapter to hook up my original Genesis controller to my laptop. And what about the rising popularity of “Lets play” videos? There are many people who want to experience a video game but don’t have the access, money or gaming skills to play through certain games. And so they’ll often watch another gamer play it on YouTube. One could argue that they are gaining an appreciation for the game, its story and characters without ever picking up a controller. And so is the argument that playing the game is the only way to truly appreciate it might have become irrelevant over the years. Games are meant to serve whatever purpose the owner desires. Maybe they’re meant to be played, maybe they’re meant to be collected, possible kept sealed or in archival casing. How you acquire satisfaction from a game depends entirely on the owner. 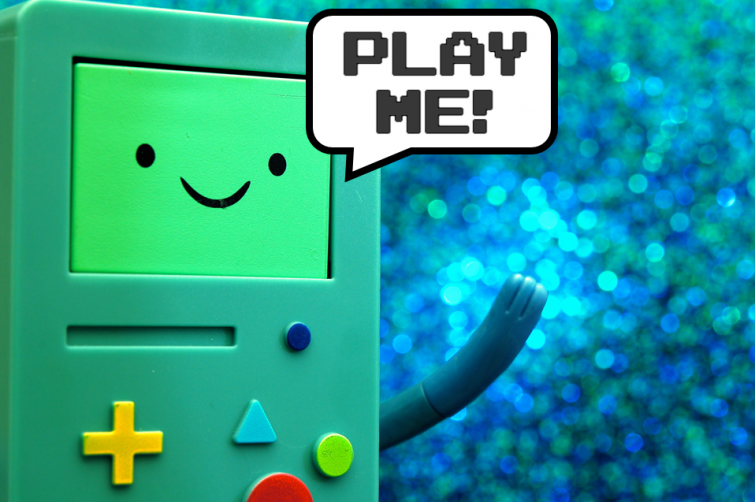 The featured photo above of BMO was created by JD Hancock; the “Play me” text bubble was added by the author of this post. Check out other game theories right here on Retro Chronicle. And please be sure to leave your thoughts in the comment section! If you’d like to write a counter argument, feel free to do so by click the “Letter to the editor” tab above. Great article! The bit about coins, guns, & stamps really drove your point home. Agreed! Just about anything can be emulated, and if you have an item that’s in good enough condition to get VGA graded why not? I think the important take-away from this piece is that all collectors have different motivations for collecting, but it would be narcissistic to expect everyone everyone else to adopt your perspective. This mentality removes the enjoyment of the hobby.